I am back in Frankfurt after a wonderful two week trip to the states! Thanks to: Trish for hosting me at her pad in Santa Rosa - I now wish I could move in next door to you! Pam for setting up a fun book blogger lunch and tour of Chronicle Books with Lara. Debbie for the book swap. Josh and Rachelle for the excellent dinner (as usual), even if I only did get one nutty irishman. Michelle for providing us with pizza to facilitate our bookish talk, Jenn for my fab book blogger holiday swap gift (I really lucked out this time! ), Deborah for the rides to and from and Swapna for the excellent gossip ;) Ann and Matt for rolling with the punches. I was so busy I was only able to read three books on my trip - REVOLUTION by Jennifer Donnelly, THE TWIN'S DAUGHTER by Lauren Baratz-Logsted and FALL FOR ANYTHING by Courtney Summers. Reviews coming up soon! I also was able to keep review books in my suitcase to a minimum because I took the plunge and got an eReader! I am now the proud owner of a color NOOK and I love it so far. Can't wait to try out the lending feature. Daniel was busy while I was gone. He booked a gallery show and did 12 paintings/drawings for it. 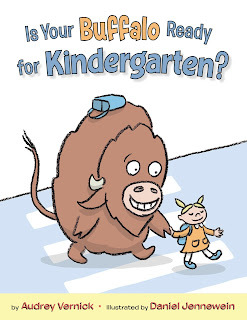 And he was also interviewed about IS YOUR BUFFALO READY FOR KINDERGARTEN? on Cynsations. Check out Daniel's interview! If you want to leave a comment, you can on Cynsations LiveJournal. Thanks for being patient with me while I was away. Now I am off to tackle the google reader and leave some blog comments. It sounds like you had a great trip. The next time you need to come down my way! Congrats to Daniel on both accounts, can't wait to hear more about his show. It was great meeting you in person! Sounds like you had a wonderful time state-side!! Wow, it sounds like a super busy trip full of bookishness. Welcome home. Sounds like you had an awesome time! Glad you're back though! So glad to have you back! It sounds like you had a wonderful time, and congratulations to Daniel! I'd love to hear about your experiences with the Nook. Glad you had a great trip.